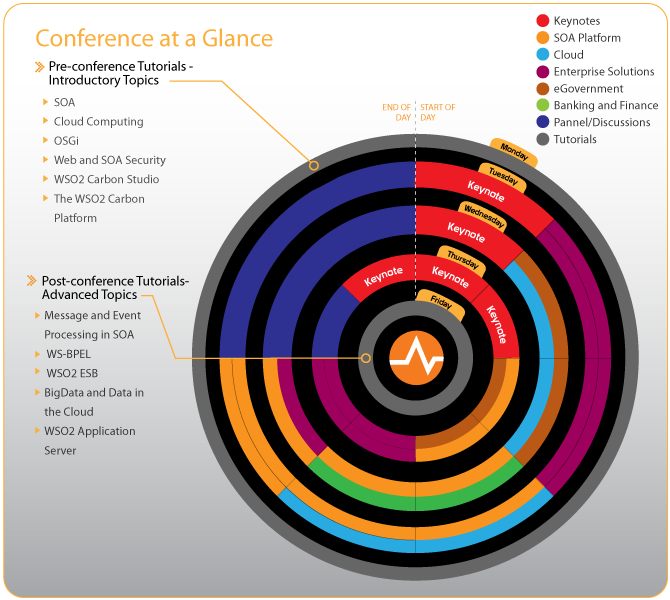 Sanjiva Weerawarana's Blog: Are you attending WSO2Con 2011? Are you attending WSO2Con 2011? WSO2Con 2011 is happening in Sri Lanka at the awesome Waters Edge Conference Center (just outside the capital Colombo) from Monday, September 12th to Friday, September 16th. Have you signed up yet? If not here are a bunch of reasons to do it NOW! This year we ran an open call for papers and selected nearly 20 external speakers to present their stories from amongst a large number of submissions. The speakers are coming from more than 10 countries (14 if I remember right) from North America, South America, Europe, Asia (including Sri Lanka, of course) and Australia/NZ. With attendees coming from various other countries too this is a truly global event with one hell of a program. I would be doing a great dis-service if I didn't highlight our keynote speakers. We have 4 outside keynotes from IBM, eBay, Google and Cognizant. Paul and I are doing keynotes too. These folks who are coming in to give the keynotes are highly accomplished individuals who will undoubtedly have superb stuff to say .. listening to them itself will justify the trip! Sri Lanka is one of the hottest tourist destinations in the world today. In one small accessible package, Sri Lanka offers everything from awesome beaches to great surf to archeology to history to mountains to hang gliding to hot air ballooning to just plain going native. After having ended a 30-year horrendous war more than 2 years ago, we're now one of the safest places in the world! Interestingly, while most places in the world are increasing their security levels Sri Lanka is massively opening up. We still of course have ways to go to build up many key infrastructure aspects in the country. In a way the whole country is under construction right now .. but not in the way that you wouldn't have the best time of your life here! Coming now will save you a lot of bucks too .. tourism in Sri Lanka WILL get much more expensive in the next 5 years! Who am I to argue with places like New York Times and National Geographic telling you to come to Sri Lanka! The conference hotel we've chosen is Cinnamon Lakeside in Colombo. This is one of the best (5-star, of course) hotels in Colombo and sits next to the Beira Lake in Colombo. In addition to being a great hotel smack in the middle of Colombo, it also houses several superb restaurants. Do not miss Royal Thai. The conference itself is being held at the very very cool Waters Edge Conference Center, about 10km (6 miles) out of Colombo. Its a very large facility and is in fact part of a golf course and is home to all the high-end events in Colombo. We will have buses organized to shuttle you to/from the hotel to the conference location. One of the best things about going to a conference is of course the opportunity to hang out with like minded people .. some of who will end up becoming your buddies for the rest of your life. At WSO2Con 2011 you will have the opportunity to interact with people from 20 countries, people who are total geeks, people who are world famous and of course the people from WSO2 who create and develop the products you love. In order to make sure you get maximum time to interact and engage with each other we are also organizing several evening events. Don't plan to leave as the sessions finish! We want you to come from wherever you are in the world. At the same time, we realize its not easy to get travel approval these days with an unknown budget to travel to an exotic destination ("you want to go to a conference where?"). If you've ever paid and attended a 5-day event anywhere in the US you know that you easily spend more than $2,900 for that week all told. This is an incredible value .. even your manager will grok it :). AND you get to spend a week in Sri Lanka as a bonus! We OF COURSE are hoping lots and lots of folks from Sri Lanka will attend! We don't have airfare included rates for that :) .. you just have to register at the regular rates (and we give a special discount to most LK organizations - government, SLASSCOM members, AMCHAM members, IESL members, etc. etc.). What are you waiting for? REGISTER NOW and reserve your spot :-). Y not a package for local students ? dey had a package, bt it wasnt visible anywhere in their website.